In the turmoil of the English Civil War (1642-1651), an engraving based on this portrait of King Charles I underwent a remarkable number of transformations. 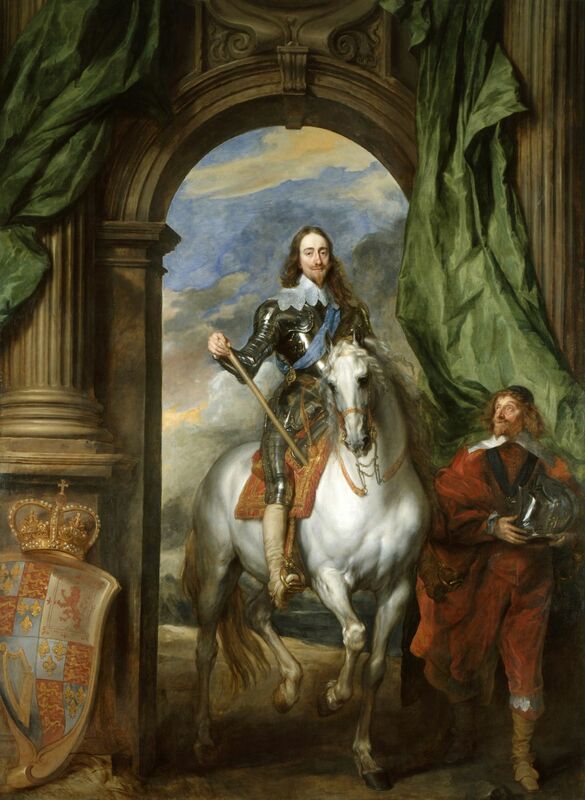 The original portrait was painted by Anthony van Dyck in 1633 (above). The French engraver Pierre Lombart then produced seven—possibly eight—versions of it during the tumultuous period in which the monarchy of England was toppled and then ultimately reinstated. Charles was beheaded in 1649 after being put on trial by the revolutionary Roundheads; England’s monarchical system of government was then replaced with, first, the Commonwealth of England (1649–1653) and then the Protectorate (1653-1659) under which Oliver Cromwell ruled as Lord Protector until he died of natural causes in 1658. His position was assumed by his son Richard until the Royalists returned to power in 1660. Cromwell’s corpse was exhumed, hung in chains, and posthumously beheaded. 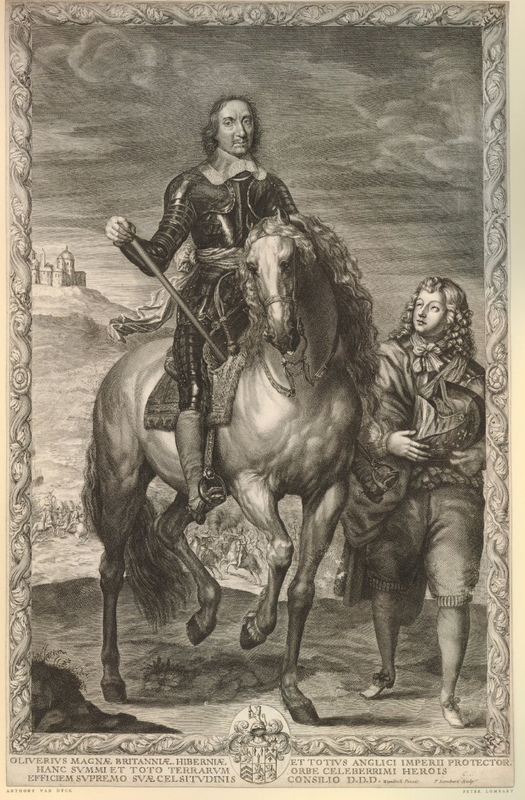 For his first engraving (1655), Lombart simply reproduced van Dyck’s portrait of the king but substituted the head of Cromwell, adding a battle in the background and a new inscription; he was paid twenty pounds (roughly $6,000 today). 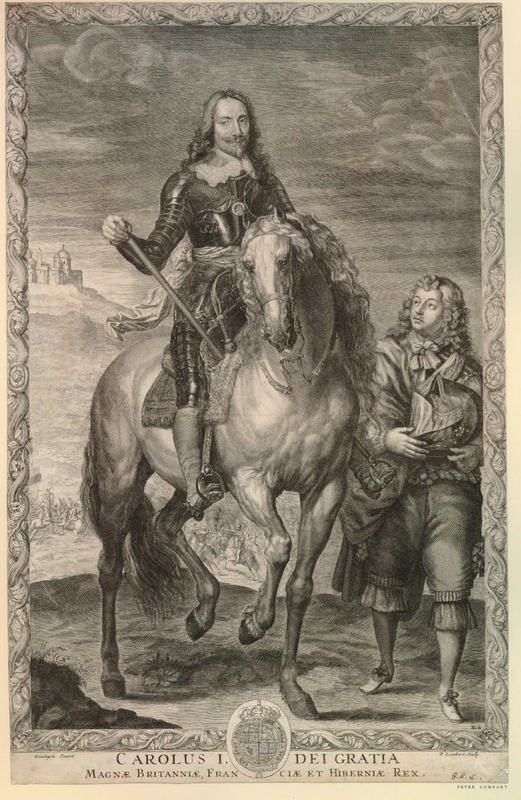 In 1658, after Cromwell had died, Lombart burnished out the head on the copper printing plate (above, left), and substituted the likeness of King Louis XIV of France; two versions of this print survive. 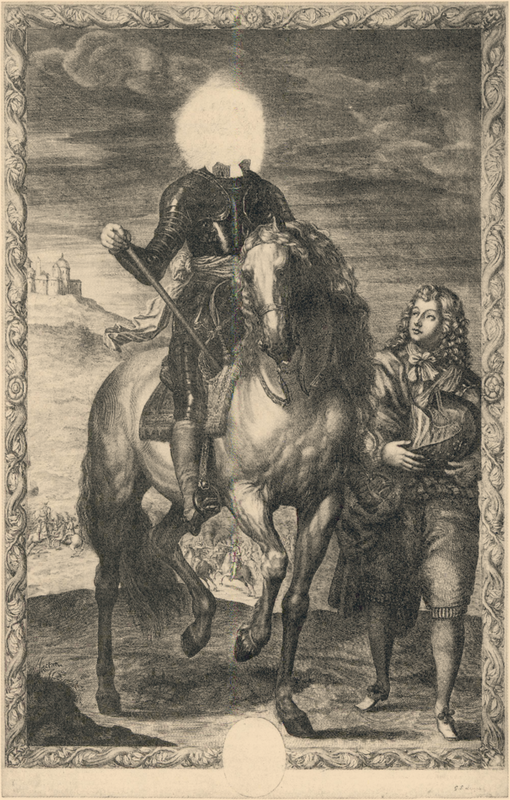 Later, for the fifth version, Louis’s head was scraped out and Cromwell’s re-engraved (above, center). Still later, likely after Lombart’s death, the head of Charles I returned (above, right)—and then, in the final version, Cromwell’s was restored. The British Museum says that there may have been an earlier first state. The Act of the Commons in Parliament for the tryal of the King was read, after the Court was called, and each member rising up as he was called. The King came into the Court, with his hat on, the Sergeant usher’d him in with the Mace. Col. Hacker, and about thirty officers and gentlemen more, came as his Guard. . . .
Mr. Cook, Solicitor General. My Lord, in behalf of the Commons of England, and of all the people thereof, I do accuse Charles Stuart, here present, of high treason, and high misdemeanours; and I do, in the name of the Commons of England, desire the charge may be read unto him. The King. Hold a little. Lord President. Sir, the Court commands the charge I be read; if you have any thing to say afterwards, you may be heard. The King smiled often during the time, especially at the words tyrant, traytor, murtherer and publique enemy of the Commonwealth. Lord President. Sir, you have now heard your charge read, containing such matter as appears in it; you find that in the close of it, it is prayed to the Court, in the behalf of the Commons of England, that you answer to your charge. The Court expects of your answer. The King. I would know by what power I am called hither. I was not long ago in the Isle of Wight—how I came there is a longer story than I think is fit at this time for me to speak of; but there I entered into a treaty with both houses of Parliament with as much publique faith as it’s possible to be had of any people in the world. I treated there with a number of honourable Lords and Gentlemen, and treated honestly and uprightly, I cannot say but they did very nobly with me, we were upon a conclusion of the treaty. Now I would know by what authority, I mean lawful—there are many unlawful authorities in the world, thieves and robbers by the high ways—but I would know by what authority I was brought from thence, and carryed from place to place (and I know not what), and when I know what lawful authority, I shal answer. Remember I am your King, your lawful King, and what sins you bring upon your heads, and the judgment of God upon this land—think well upon it—I say, think well upon it, before you go further from one sin to a greater. Therefore let me know by what lawful authority I am seated here, and I shall not be unwilling to answer. In the mean time I shall not betray my trust; I have a trust committed to me by God, by old and lawful descent—I will not betray it to answer to a new unlawful authority; therefore resolve me that, and you shall hear of me. Lord President. If you had been pleased to have observed what was hinted to you by the Court at your first coming hither, you would have known by what authority; which authority requires you in the name of the People of England, of which you are elected King, to answer them. The King. No Sir, I deny that. Lord President. If you acknowledge not the authority of the Court, they must proceed. The King. I do tell them so: England was never an elective kingdom, but an hereditary kingdom for near these thousand years; therefore let me know by what authority I am called hither. I do stand more for the liberty of my people than any here that come to be my pretended judges; and therefore let me know by what lawful authority I am seated here, and I will answer it: otherwise I will not answer it. Lord President. Sir, how really you have managed your trust, is known; your way of answer is to interrogate the Court, which beseems not you in this condition. You have been told of it twice or thrice. The King. Here is a gentleman, Lieut. Col. Cobbet: ask him, if he did not bring me from the Isle of Wight by force? I do not come here as submitting to the Court; I will stand as much for the priviledge of the House of Commons, rightly understood, as any man here whatsoever. I see no House of Lords here that may constitute a parliament, and The King too should have been. Is this the bringing of The King to his Parliament? Is this the bringing an end to the treaty in the publique faith of the world? Let me see a legal authority warranted by the Word of God the Scriptures, or warranted by the constitutions of The Kingdom, and I will answer. Lord President. Sir, you have propounded a question, and have been answered. Seeing you will not answer, the Court will consider how to proceed: in the mean time, those that brought you hither are to take charge of you back again. Lord President. Sir, you may remember at the last Court you were told the occasion of your being brought hither, and you heard a charge read against you containing a charge of high treason and other high crimes against this realme of England. You heard likewise, that it was prayed in the behalf of the People, that you should give an answer to that charge, that thereupon such proceedings might be had as should be agreeable to justice. You were then pleased to make some scruples concerning the authority of this Court, and knew not by what authority you were brought hither. . . . The King. When I was here last, ’tis very true I made that question, and truly if it were onely my owne particular case, I would have satisfied my selfe with the protestation I made the last time I was here against the legality of this Court, and that a king cannot be tryed by any superiour jurisdiction on earth; but it is not my case alone, it is the freedome and the liberty of the People of England, and do you pretend what you will, I stand more for their liberties. For if power without law may make lawes, may alter the fundamentall lawes of The Kingdome, I do not know what subject he is in England that can be sure of his life or any thing that he calls his owne. Therefore when that I came here, I did expect particular reasons to know by what law, what authority you did proceed against me here, and therefore I am a little to seek what to say to you in this particular claim because the affirmative is to be prov’d, the negative often is very hard to do. But since I cannot perswade you to do it, I shall tell you my reasons as short as I can. Lord President. Sir, I must interrupt you, which I would not do, but that what you doe is not agreeable to the proceedings of any Court of Justice: you are about to enter into argument, or dispute concerning the authority of this Court before whom you appear as a prisoner, and are charged as an high delinquent. . . . The King. Sir, by your favour, I doe not know the forms of law, I doe know law and reason, though I am no lawyer profess’d, but I know as much law as any gentleman in England; and therefore, under favour, I do plead for the liberties of the People of England more than you doe, and therefore if I should impose a beliefe upon any man without reasons given for it, it were unreasonable. But I must tell you that that reason that I have, as thus informed, I cannot yeeld unto it. Lord President. Sir, I must interrupt you: you may not be permitted. You speak of law and reason; it is fit there should be law and reason, and there is both against you. Sir, the vote of the Commons of England assembled in Parliament, it is the reason of The Kingdome, and they are these that have given to that law, according to which you should have rul’d and reigned. Sir, you are not to dispute our authority; you are told it again by the Court, and your contempt will be recorded accordingly. The King. I doe not know how a king can be a delinquent; but any law that ever I heard of, all men—delinquents or what you will—let me tell you they may put in demurrers against any proceeding as legall, and I doe demand that, and demand to be heard with my reasons: if you deny that, you deny reason. Lord President. Sir, you have offered something to the Court: I shall speak something unto you the sence of the Court. Sir, neither you nor any man are permitted to dispute that point, you are concluded, you may not demurre the jurisdiction of the Court: if you do, I must let you know that they overrule your demurrer. They sit here by the authority of the Commons of England, and all your predecessors and you are responsible to them. The King. I deny that: shew me one precedent. Lord President. Sir, you ought not to interrupt when the Court is speaking to you: this point is not to be debated by you, neither will the Court permit you to do it. . . . The King. I say, Sir, by your favour, that the Commons of England was never a Court of Judicature: I would know how they came to be so. Lord President. Sir, you are not to be permitted to go on in that speech and these discourses. Then the Clerk of the Court read as followeth: Charles Stuart, King of England, you have been accused on the behalf of the People of England of high treason and other crimes; the Court have determined that you ought to answer the same. The King. I will answer the same so soone as I know by what authority you do this. Lord President. If this be all that you will say, then gentlemen—you that brought the prisoner hither—take charge of him back againe. The King. I doe require that I may give in my reasons why I do not answer, and give me time for that. Lord President. Sir, ’tis not for prisoners to require. The King. Prisoners? Sir, I am not an ordinary prisoner. Lord President. The Court hath considered of their jurisdiction, and they have already affirmed their jurisdiction; if you will not answer, we shall give order to record your default. The King. You never heard my reason yet. Lord President. Sir, your reasons are not to be heard against the highest jurisdiction. The King. Shew me that jurisdiction where reason is not to be heard. Lord President. Sir, we shew it you here—the Commons of England; and the next time you are brought you will know more of the pleasure of the Court—and, it may be, their final determination. The King. Shew me where ever the House of Commons was a Court of Judicature of that kind. Lord President. Sergeant, take away the prisoner. The King. Well, sir, remember that The King is not suffer’d to give his reasons for the liberty and freedome of all his subjects. Lord President. Sir, you are not to have liberty to use this language. How great a friend you have been to the laws and liberties of the people, let all England and the world judge. The King. Sir, under favour it was the liberty, freedom, and laws of the subject that ever I took… [text missing] …defended my selfe with armes, I never took up armes against the People, but for the lawes. Lord President. The command of the Court must be obeyed. No answer will be given to the charge. And so was guarded forth to Sir Robert Cotton’s house. Then the Court adjourned to the Painted Chamber on Tuesday at twelve a clock, and from thence they intend to adjourne to Westminster Hall, at which time all persons concerned are to give their attendance. This entry was posted in Uncategorized and tagged 17th Century, Anthony van Dyck, Art, Belgium, English Civil War, France, Great Britain, King Charles I, Law, Painting, Pierre Lombart, Portraits, Printmaking, Revolution. Bookmark the permalink.